Chromatography is the most widely used technique for separation of mixtures. Chromatography accessories and consumables constitute instruments and laboratory equipment which together complement chromatography systems. The technological development over the years in the field of analytical technology has eventually increased the accuracy and precision of chromatography techniques. The rising demand for quality and purity of various chemicals and active pharmaceutical ingredients (APIs) is supplementing the market growth of chromatography accessories and consumables market. Increased availability and acceptability of chromatography accessories and consumables would further boost the growth of the market in the near future. Various applications of chromatography techniques are across industries such as pharmaceutical drug discovery (pharma companies, life science research, CROs, etc. ), food and beverage, forensics, oil & gas, chemicals, sports, polymers, and medicine. Chromatography accessories and consumables market has been segmented based on the product type and end users. The product segments include chromatography media/resins; columns and column accessories; chromatography detectors and accessories; chromatography filters; solvents, buffers and adsorbents; and other accessories and consumables. The end users of chromatography accessories and consumables includes academics and research; hospitals and diagnostic laboratories; pharmaceuticals; food and agriculture; and others. Solvents, buffers and absorbents segment was observed as the largest and fastest growing product segments in chromatography accessories and consumables market. The key factor responsible for its market dominance and significant growth is increasing demand for solvents, buffers and adsorbents from pharmaceutical and research industries globally and recurring demand for continuing existing operations by the biopharmaceutical and biotechnology companies. In the end-users market, pharmaceuticals was the largest segment. The major factors driving the pharmaceutical chromatography accessories and consumables market are high prevalence and increasing incidences of several chronic diseases, potential drug discovery and development activities, and increased government funding toward R&D activities, especially in health care. The geographical segmentation of chromatography accessories and consumables market include North America, Europe, Asia Pacific, Latin America and Middle East & Africa. 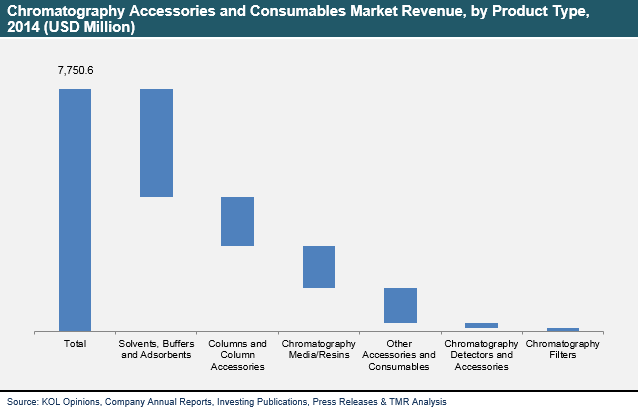 North America chromatography accessories and consumables market accounted for largest share i.e. 40.2% of the global market in 2014. The major factors driving the growth of the North America chromatography accessories and consumables market are well established research infrastructure, high demand for new and innovative products, increasing chromatography application areas such as medicine, forensics, and cosmetics and increased government support for R&D activities. Asia Pacific chromatography accessories and consumables market is the fastest growing region during the forecast period 2015 to 2023. Improving economic condition and infrastructure especially in health care, growing number of R&D activities, increasing demand for innovative chromatography products and expansion of global companies in the region is expected to drive the market with significant growth in the near future. The key players operating in chromatography accessories and consumables market are Agilent Technologies, Inc., Bio-Rad Laboratories, Inc., GE Healthcare, EMD Millipore, Pall Corporation, PerkinElmer, Inc., Phenomenex, Thermo Fisher Scientific, Inc., Shimadzu Corporation, Sigma-Aldrich Corporation, Tosoh Corporation, and Waters Corporation. In terms of revenue it was observed that Waters Corporation held the largest share of the global chromatography accessories and consumables market in 2013. The key market players are actively involved in constant innovations and developments related to technology and application to maintain their positions in the global chromatography accessories and consumables market. This report on the chromatography accessories and consumables market studies the current as well as future prospects of the market globally. The stakeholders of this report include companies and intermediaries engaged in the manufacturing and commercialization of various chromatography accessories and consumables as well as new entrants that are planning to enter the chromatography market. This report comprises an elaborate executive summary with a market snapshot providing overall information of various segments and sub-segments considered in the study scope. This section also provides overall information and data analysis of the global chromatography accessories and consumables market with respect to the leading market segments based on product types, end-users and geographies. The global chromatography accessories and consumables market has been studied based on major product segments, end-users, and regional as well as national markets. Based on product types, the global market has been categorized into six major segments: chromatography media/resins; columns and column accessories; chromatography detectors and accessories; chromatography filters; solvents, buffers and adsorbents; and other accessories and consumables. The market for these segments has been extensively analyzed based on of their usefulness, effectiveness, sales, and geographic presence. Market revenue in terms of USD million for the period between 2013 and 2023 along with the compound annual growth rate (CAGR %) from 2015 to 2023 are provided for all the segments, considering 2014 as the base year. In terms of end-users, the market has been categorized into academics and research; hospitals and diagnostic laboratories; pharmaceuticals, food and agriculture, and others (forensics, oil & gas, cosmetics, chemicals, etc.). Market revenue in terms of USD million for the period between 2013 and 2023 along with the compound annual growth rate (CAGR %) from 2015 to 2023 are provided for all the segments, considering 2014 as the base year. The market overview section of the report explores market dynamics such as drivers, restraints, and opportunities that currently have strong impact on the chromatography accessories and consumables market and could influence the market in the future as well. Market attractiveness analysis has been provided in the market overview section in order to explain the intensity of competition in the market across different geographies. Porter’s Five Forces analysis is also explained in this section to understand the chromatography accessories and consumables market considering different parameters that have an impact on the sustainability of the companies operating in the market. The competitive scenario among different market players is evaluated through market share analysis in the competitive landscape section of the report. All these factors would help market players to take strategic decisions in order to strengthen their positions and expand their shares in the global market. Geographically, the chromatography accessories and consumables market has been categorized into five regions: North America, Europe, Asia Pacific, Latin America, and Middle East & Africa (MEA). The geographic regions have been further divided into major national markets, viz. North America (the U.S. and Canada), Europe (Germany, the U.K., France, and Rest of Europe), Asia Pacific (China, Japan, India, and Rest of Asia Pacific), Latin America (Brazil, Rest of Latin America), and MEA (South Africa, Rest of MEA). Market revenue in terms of USD million for the period between 2013 and 2023 along with the CAGR % from 2015 to 2023 are provided for all the regional and national markets considering 2014 as the base year. The recommendations section included in the report would assist existing market players in expanding their market shares and new companies in establishing their presence in the global market. The report also profiles major players in the chromatography accessories and consumables market based on various attributes such as company overview, financial overview, business strategies, product portfolio, and recent developments. Major players profiled in this report include Agilent Technologies, Inc., Bio-Rad Laboratories, Inc., GE Healthcare, EMD Millipore, Metrohm AG, Pall Corporation, PerkinElmer, Inc., Phenomenex, Thermo Fisher Scientific, Inc., Shimadzu Corporation, Sigma-Aldrich Corporation, Tosoh Corporation, Waters Corporation, and W.R. Grace & Co.